Editor’s note: This is an exciting development for researchers in addiction history and a welcome contribution from Weiner and White. 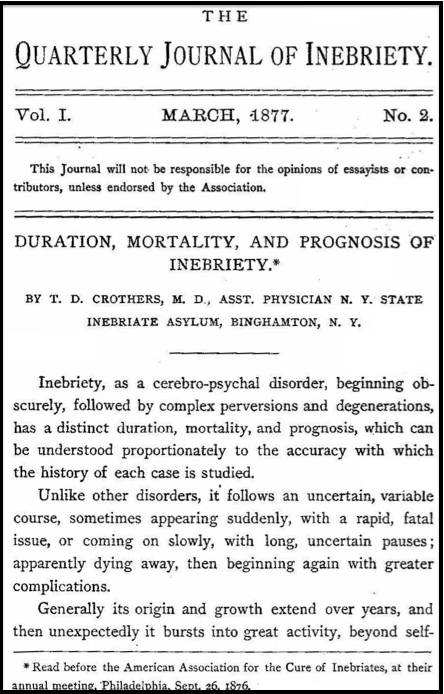 After more than a decade of persistent searching and meticulous collecting, a team led by historian William L. White and Hazelden Library Manager Barbara Weiner has acquired and digitized all 141 issues of the Quarterly Journal of Inebriety, which, from 1876 to 1914, documented the earliest stages of addiction medicine in the United States. The Quarterly Journal of Inebriety (QJI) was published by the American Association for the Study and Cure of Inebriety (AACI), a group of managers and doctors that formed in 1870 to normalize and improve practices at the residential treatment institutions that had been springing up since midcentury. Its sole editor for 38 years was T.D. Crothers, superintendent at the Walnut Hill Asylum in Hartford, Connecticut and a leading advocate of the medical treatment of inebriety until his death in 1918. The QJI‘s central principle was the disease concept of alcohol and opiate inebriety and although it announced the AACI’s position on various issues, its commitment was to medical knowledge over moral or legal polemic. It was received with some hostility by critics of the disease concept, as well as by temperance advocates and religious reformers refused publication by Crothers for their unscientific approaches. It folded, upon the collapse of the field it represented, when public and political attention to the issue shifted decisively from individual vulnerabilities to dangerous–soon to be illegal–substances (Weiner and White, 2007, see below). “As the nation’s first scientific addiction journal, [QJI] remains an important resource for us today, in terms of setting contemporary issues in historical context,” said White, emeritus senior research consultant for Illinois-based treatment provider Chestnut Health Systems. “I’m proud that we’ve been able to make it readily and comprehensively available to the public.” White began collecting issues while doing the research for his monumental history of addiction treatment, Slaying the Dragon: The History of Addiction Treatment and Recovery in America (1998). Weiner and her team at Hazelden took up the project in 2000. 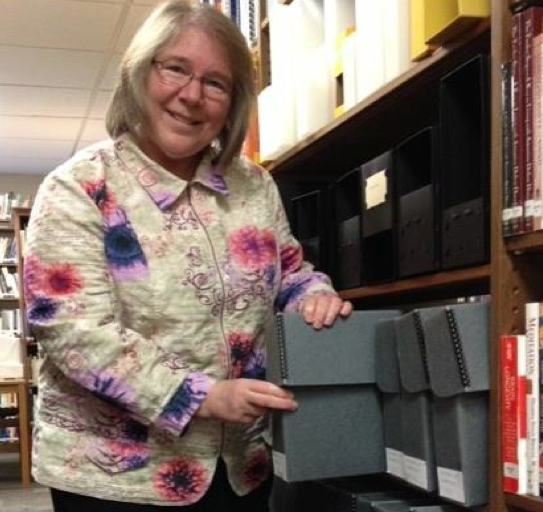 Barbara Weiner showcases the Journal of Inebriety archive in Hazelden’s Center City, Minnesota, library. QJI‘s advertising is equally fascinating, aimed as it was toward professionals in the treatment industry itself. 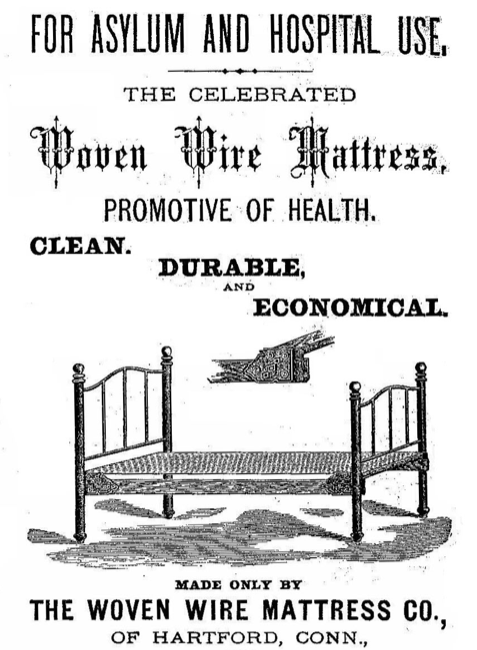 Today’s problem of securing “detox beds” was a quite literal one for managers of the inebriate asylums of the nineteenth century. The hard copies of QJI reside at Hazelden in Center City, Minn., but the entire 35-volume collection is openly available in pdf form through Hazelden’s online catalog and at White’s professional website. The scans aren’t searchable, but a collation of the volume-by-volume indexes (pdf) is available to help track down names and topics. For students and researchers interested in using the QJI archive in pursuit of academic study, scholarship funds are available via the Hazelden-Heckman Endowment Fund, Weiner added. ← Previous Post The Return of the Crack Baby. Again. Are there any short stories in the journal? Thanks. Susan, the QJI was like a modern professional journal in its strict focus on the science of inebriety and its treatment, so no fiction. Check out Barb and Bill’s 2007 article (linked above) for a thorough summary of what it did contain. Morning, thanks for this post. The link to the indexes appears to be dead. Thanks for the catch–fixed it. Great source. Hope to put some students onto it soon. Well done you guys. Fantastic news! Well done, Bill and Barbara–many thanks. I had to travel to get at these as a graduate student. This is major contribution!